I keep wanting to refer to our record breaking current snow weather. When it kinda takes over your life, it’s hard for it not to be on your constant radar. Since Friday, we started getting dumped on. In 3 days, we had over 80 cm, or 31″. For a place that is use to mowing their lawn nearly year around, that is a LOT. And it’s not over yet. Wednesday will bring more! 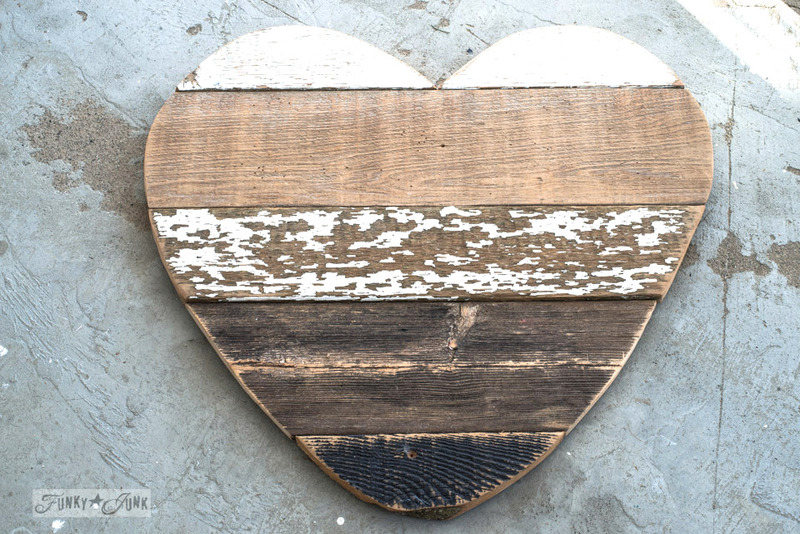 Between all the shovelling lately, yesterday I started this junk heart project. I was bound and determined to MAKE SOMETHING COOL that would last, rather than just do endless tasks that would be erased with high winds… if you get my ‘drift.’ Heh. 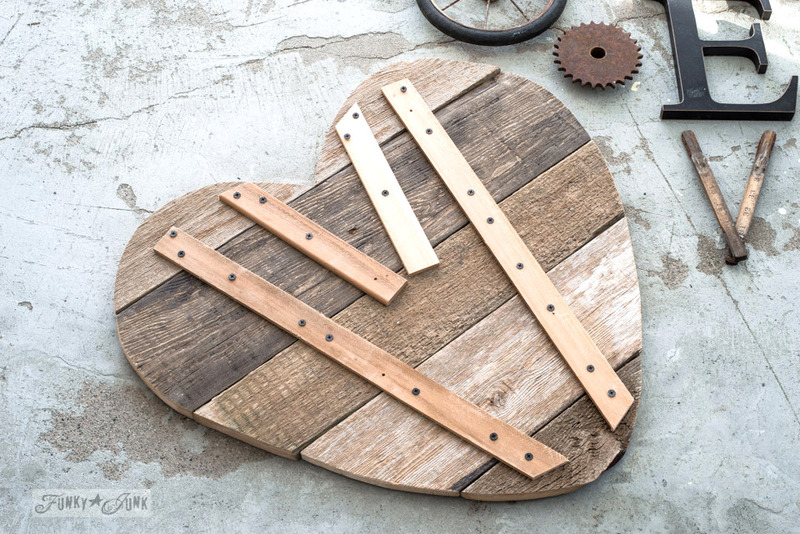 Anyway… I wanted to get in on the reclaimed wood Valentine heart craze before Feb 14th. 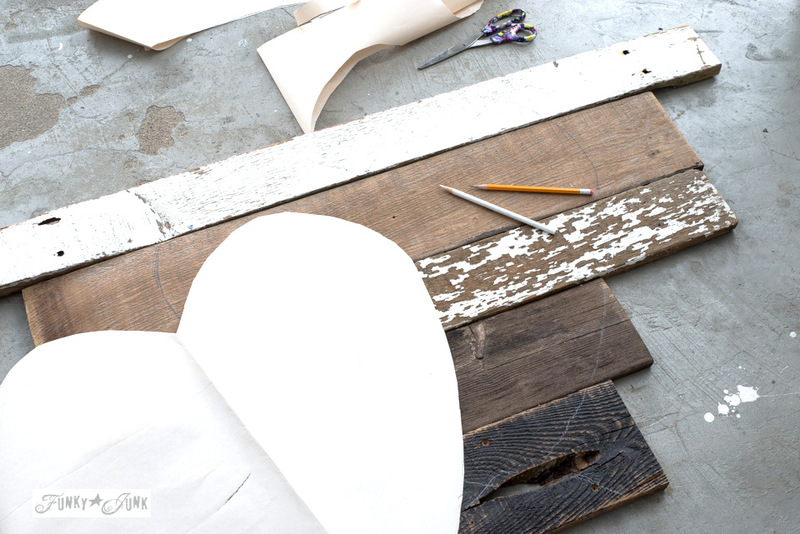 I’ve made some salvaged hearts before HERE, but they were a little more crafty. This round, I wanted to use my beloved wood scraps. So after a little messing around, I think this heart turned out pretty cool! You see, my junk generally works for its keep. Very good work ethic! And then the ideas wouldn’t stop. 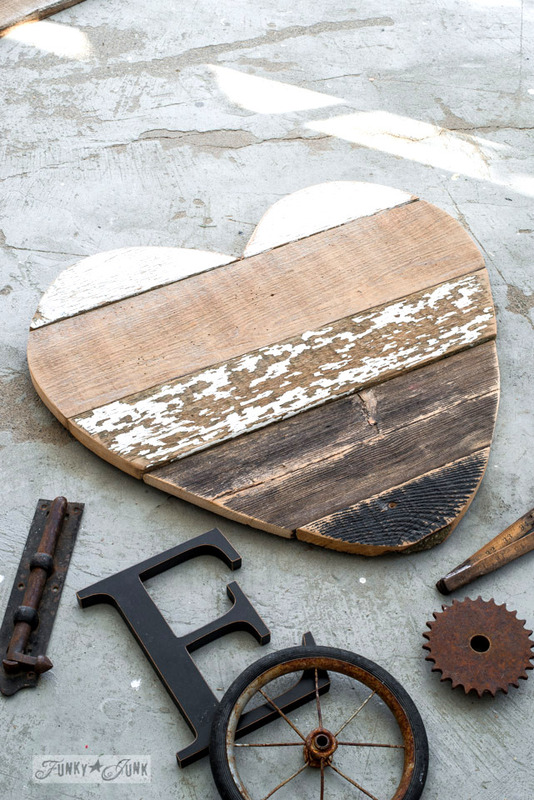 Hence… here’s 3 ways to use a reclaimed wood junk heart! 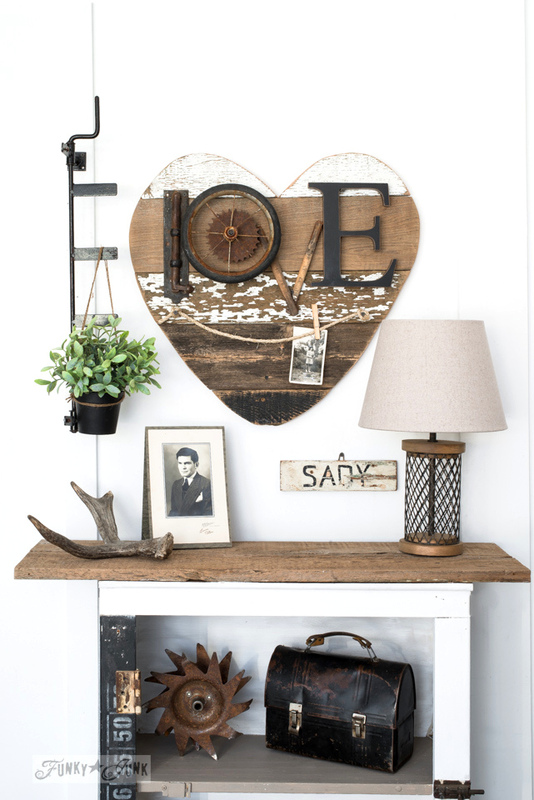 Just don’t be too surprised to see this rustic heart do something new in a future post… it’s that versatile. Let’s start with the heart first. This heart is not hard to make. Just a bit fiddly cutting the pieces just so. 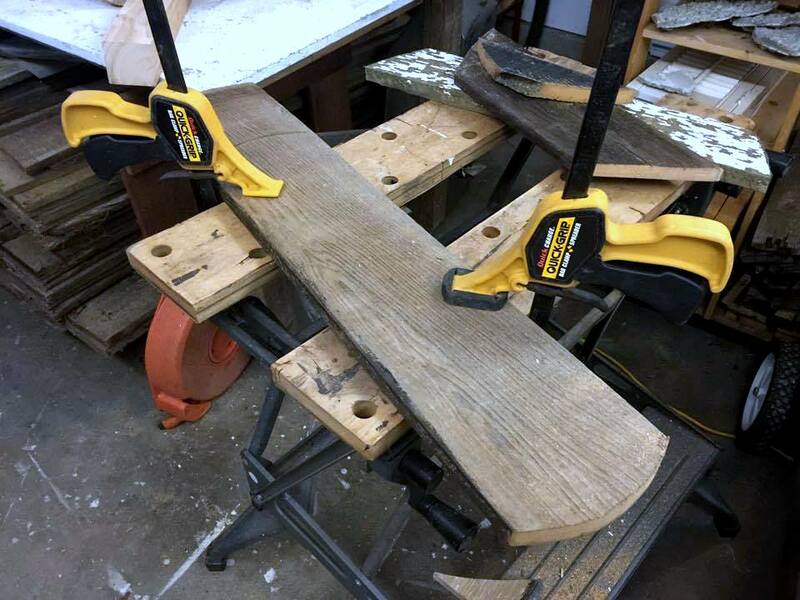 But no worries… it’s totally do-able if you have a decent jig saw handy. 1. Stack random wood planks together, arranged in the order you’d like them to appear in your heart. I did nothing new to these planks. They were just scraps as is. But the bottom one had been painted black, and the one on top of it wears Miss Mustard Seed’s antique wax, (Amazon affiliate link) from THIS toolbox shelf project. 2. 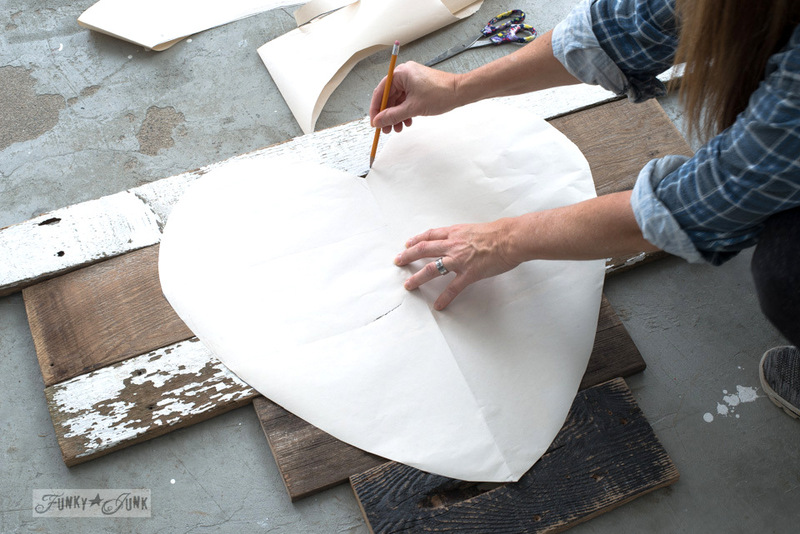 Decide how large you’d like the heart, then create a template, by folding a large sheet of paper in half, drawing half the heart. Make sure it fits on the wood. 3. 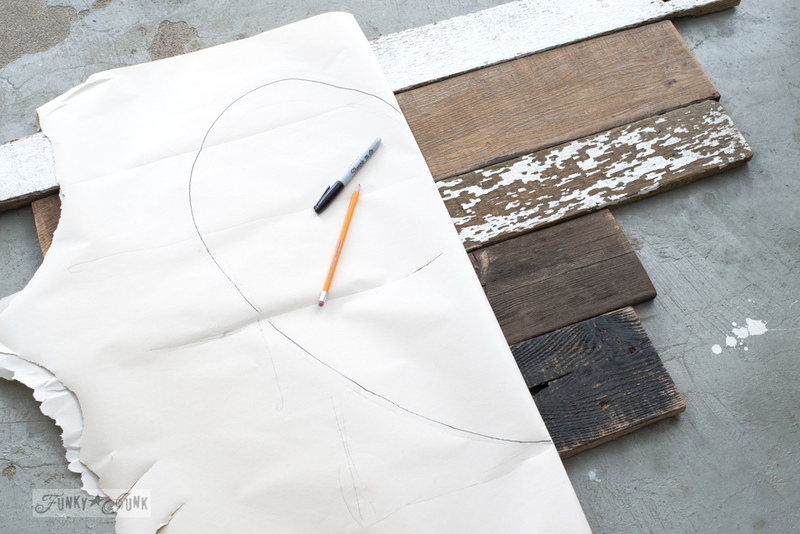 Cut out the heart template, then trace the shape onto the wood, rotating between using a pencil, chalk, or white pencil crayon. Whatever shows up best. 4. Cut each wood piece as drawn, using a jig saw. I like to use a couple of clamps to hold the boards in place, alongside a little workmate work bench. You may be able to get away with holding some pieces while you cut, but being that my jig saw is heavy, I prefer using both hands while using it. I think I need to look into a new one… I want THIS ONE. 5. Brace the back in some way, so all the boards are supported. If using cedar strips like I did, I suggest to pre-drill holes, or the strips may split when you attach them. 6. After assembling, you’ll find some edges won’t meet perfectly. Re-smooth the edges with a jig saw. 7. Lightly sand the edges, and across the front of the boards. And you have yourself a wooden heart! The finished heart above measures at 24″ x 24″. And now for the very best part… let’s get it to do something cool. 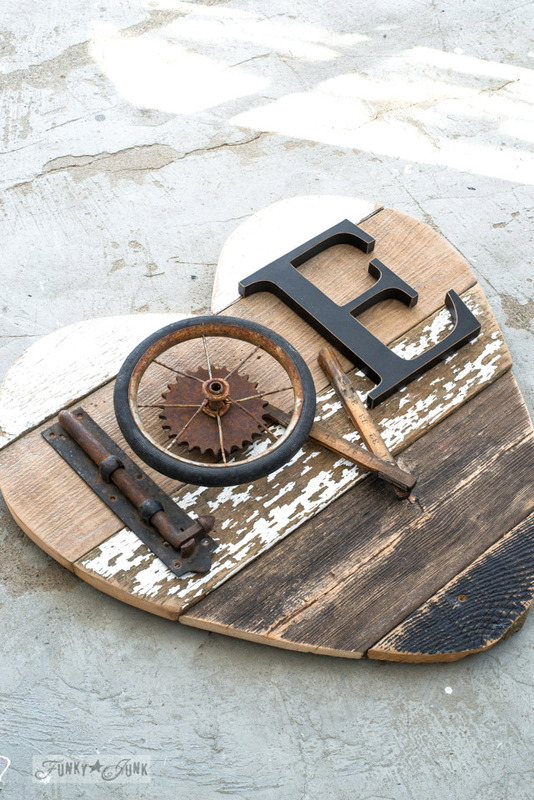 A junk themed LOVE. Anything that kinda looked like a letter did the trick. To attach the junk letters, hold in place, then use screws to brace. The head of the screw will hold most things. Click on the hung up pictures to better see. The wheels were installed by inserting a long screw first to create a ‘hook’. To give the O more of a 3D effect, a gear was layered with a bike wheel. Ok, so it looks cool, but it isn’t doing anything yet… let’s change that! 1. 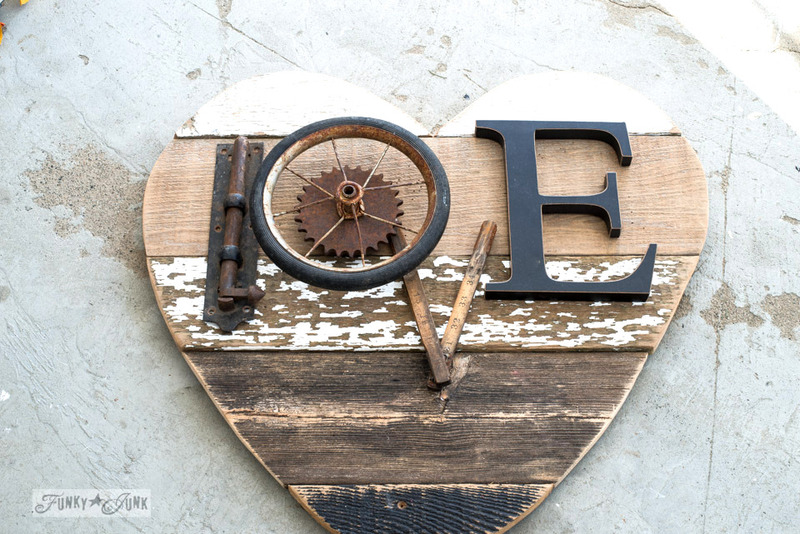 Reclaimed wood LOVE heart picture hanger! 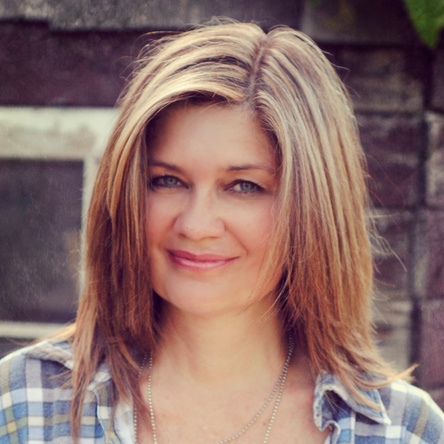 So, I thought… WHO do I love? I love my parents… so that was easy! But I also love how easily the photos can be changed out on the twine. Fun way to celebrate special occasions or just because. A little piece of twine was knotted on each end, then attached through the knots with screws. Well, that was fun! But… what about for an everyday kinda task? 2. 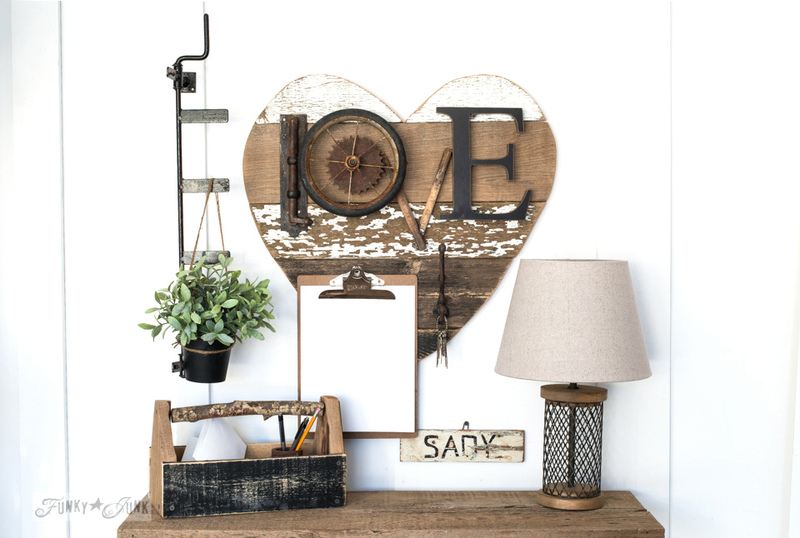 I Love Junk reclaimed wood heart writing station! 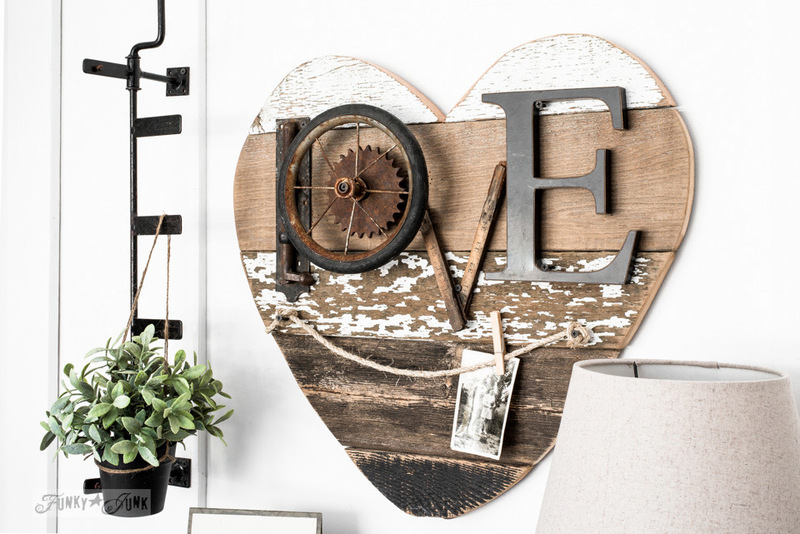 We LOVE junk,yes? So to me, this spells out my passion. How suitable would this writing station be, hung in a workshop or craft room, depending where you practice your own passion? Wouldn’t it be cool if the circle stuff had working clock hands?! The clipboard is hanging from a screw. A hook was installed for keys. 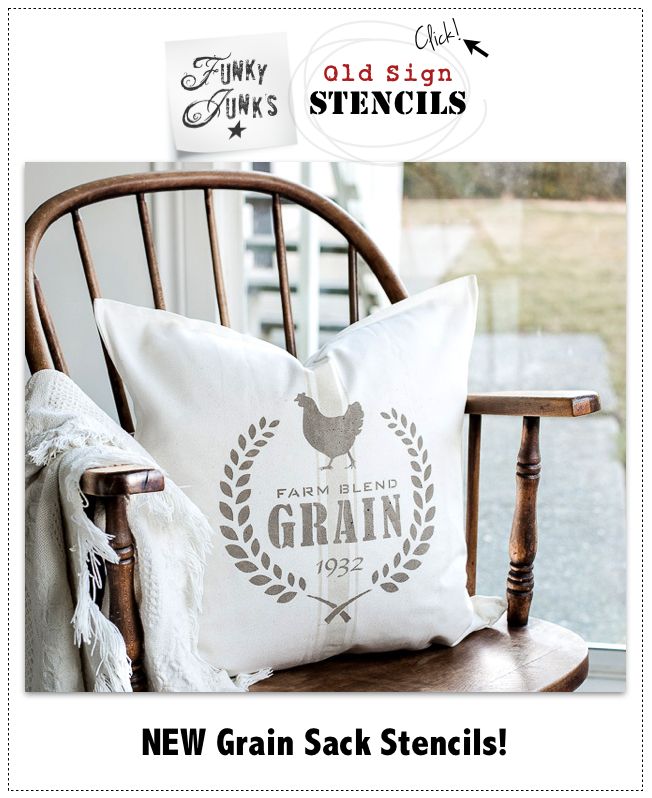 Perfect for a small entry, or even a kitchen, for grocery listing. Ok, so let’s switch gears a bit. What ELSE do I love, other than junk? Any guesses before you scroll? 3. 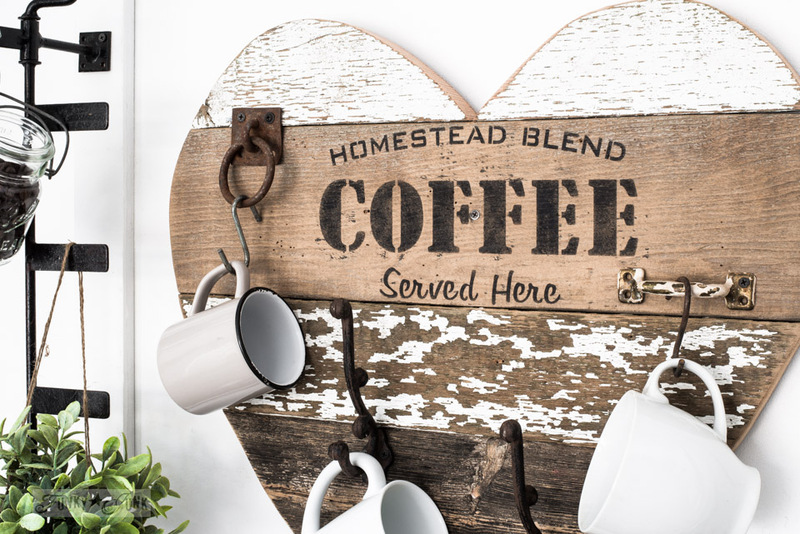 I LOVE COFFEE reclaimed wood heart mug hanger! 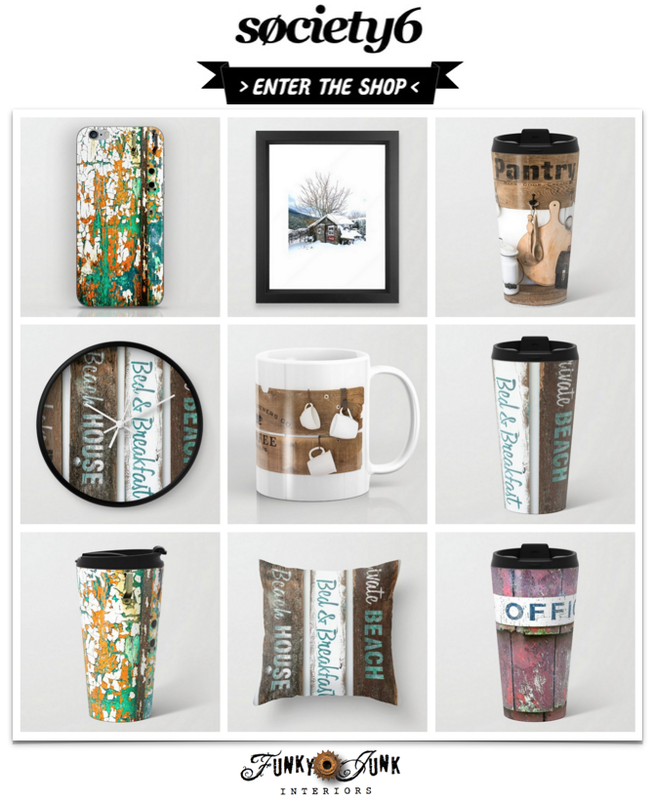 Your fav mugs at your fingertips… mandatory for your AM fix. 1. 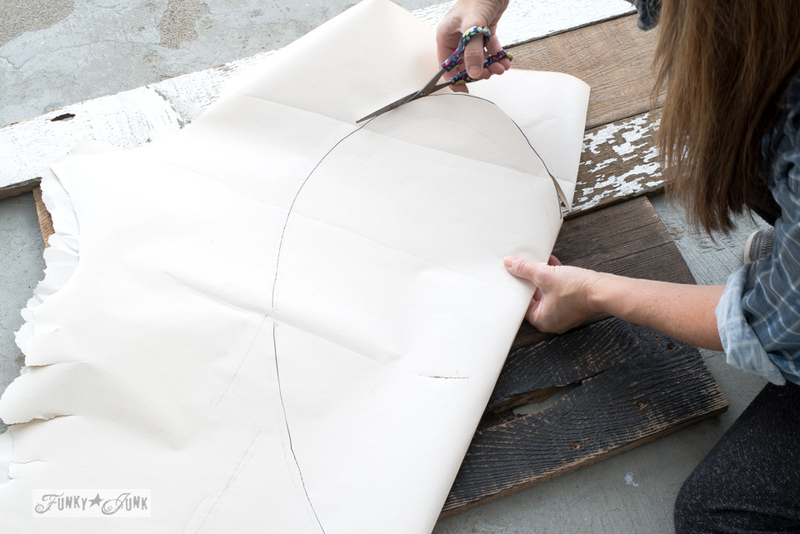 Position stencil of choice where desired, using masking tape. 2. Load a stencil brush with paint, then remove most of the paint onto a rag, creating a ‘dry’ brush. 3. Pounce the paint into the letters, attempting to achieve sort of a powdery, weathered effect. Tip: The dryer your brush, the sharper your letters will be. And a few minutes later, you have yourself a coffee sign! If you ever change your mind about the message on your heart, simply use a palm sander to remove the paint, then change your message. True story. I had stencilled a different design on this first, then changed my mind. It was that easy to change out. Snow just sounds cold, do I dare tell you its been in the 70’s here this week? 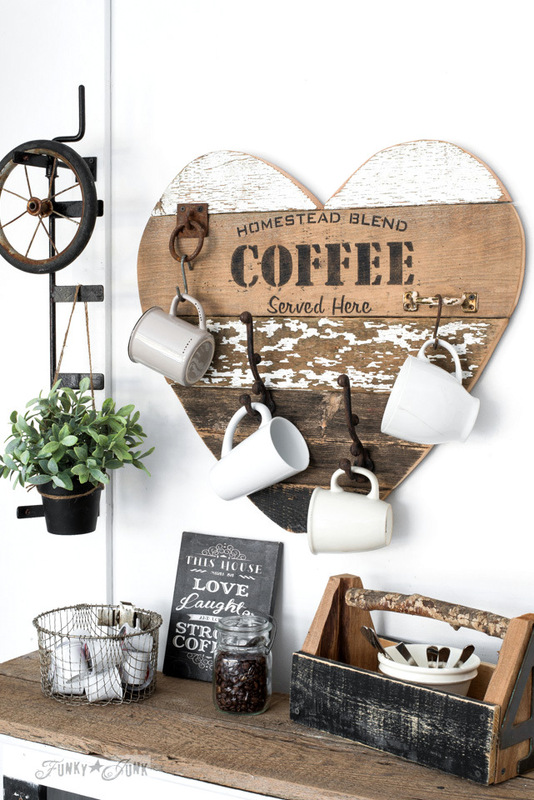 I love the first heart but that second one used as a coffee station is awesome! 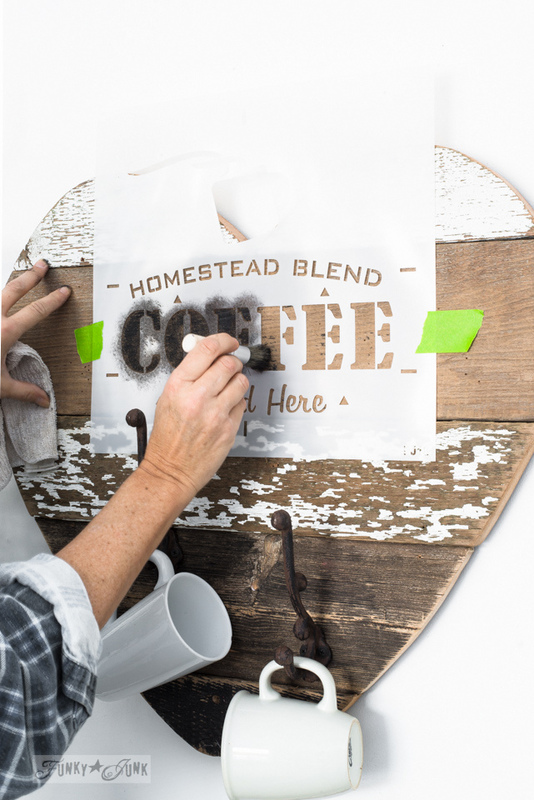 Time to order a new Coffee stencil – I love this even though I’m more of a Tea gal these days. The plant hanger to the left is also very cool. So many details in this post and I love them all. Very nice! Just one question, what did you use to attach the letters to your heart? Thanks in advance. Oh my… I forgot to address that! Everything was just screwed into place. If you click on the photos and look closely, you’ll see the screws. I just held something, then drove in a screw in certain places to hold it in place. The head of the screw kept things in place. This heart is gorgeous! 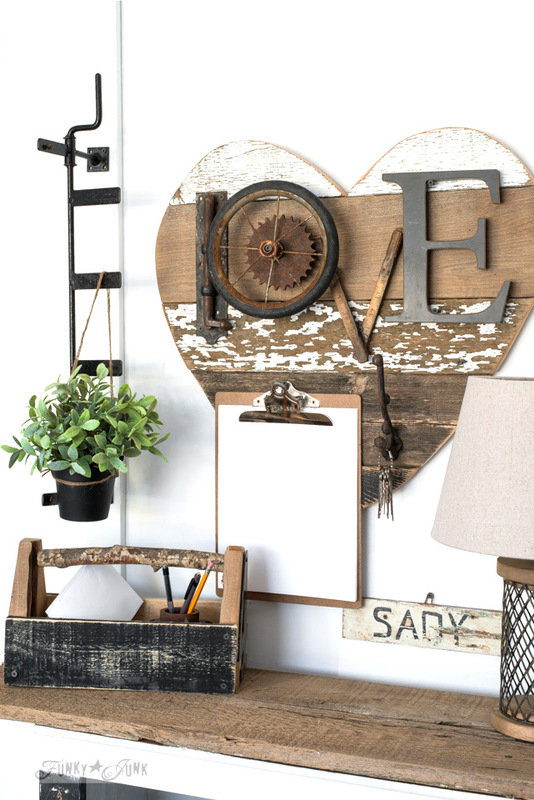 The “Love” version is calling my name.Unfortunately I know nothing about using power tools but maybe I can persuade my hubby to make me one. As far as the snow goes, I am about 30 miles south of Seattle and the 7 inches we got this week was plenty for me. 31 inches, yikes!! Great heart and I like ALL the ways you used it. That certainly is a lot of snow for you, how’d you like that all winter long? Your heart is sooo cute! I love it!! 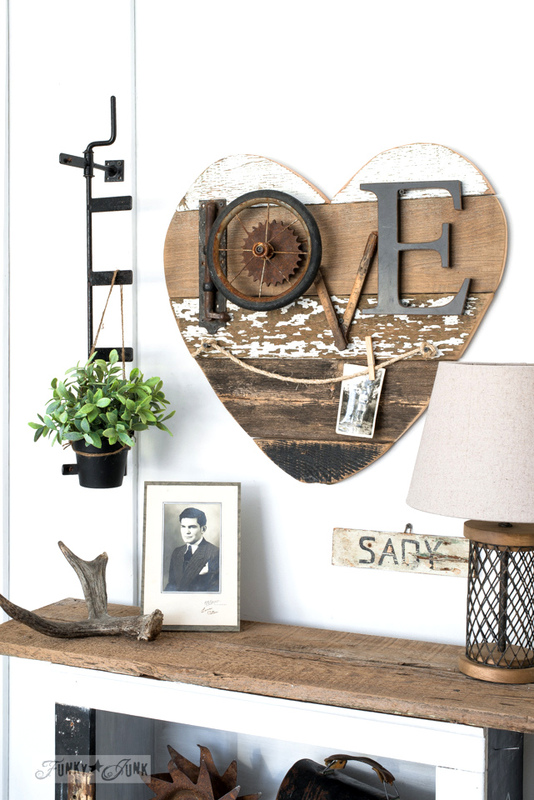 What a wonderful grouping with the heart as the focus and the twine for photos to make the piece work for you. Very clever indeed! Your creations are the bees knees. You are a wealth of interesting ideas. I love seeing your work and hope to create like you in the future. I love your love heart. I am a fan of hearts anyway, but yours is awesome! Thank you for sharing and very detailed directions on making one. Your site is amazing. 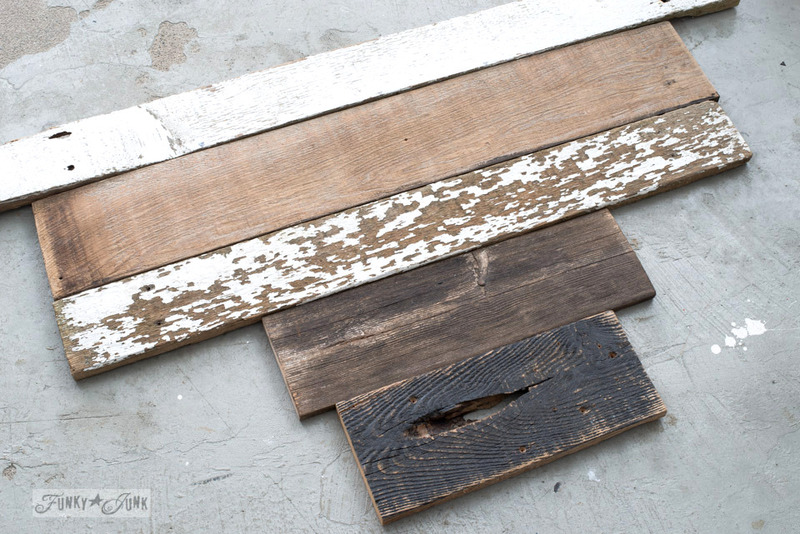 I love reclaimed junk. Love the heart in all the ways you used, but the coffee ‘one’ is my favorite. 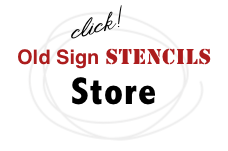 I love stenciling and having words all over my home. After I finish this entry I am going to look into your favorite jigsaw. I’m a thinkin I could use one. Have used the orbital hand sander hubby got me and I love it. I actually didn’t have sore arms or shoulders after using. That’s new. I can see the right tools make all the difference. Thanks for the post. I so wish I could come to your home and play. Ha!Ha! Amazing ideas! Love the heart in all it’s forms! So inspirational! Is it possible for us to see how the back looks? And guess what? 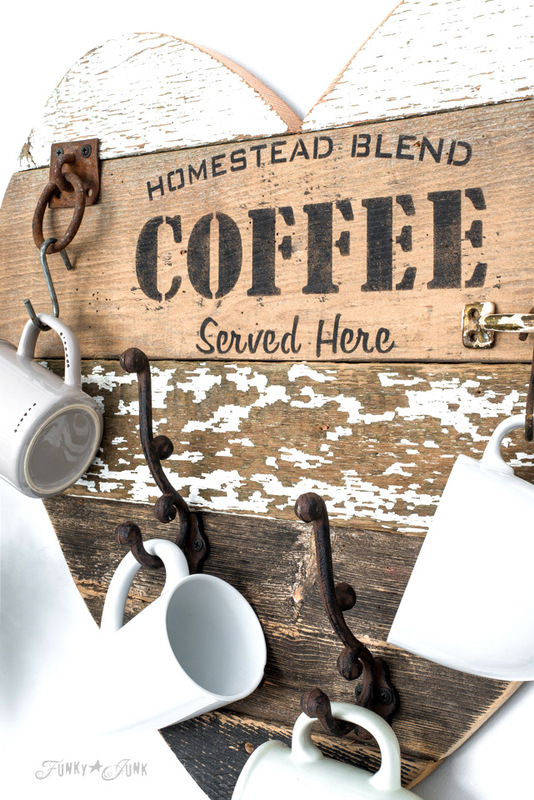 My neighbor let us have some of the old barn wood from his property last summer and it’s just sitting there begging to be this…. Thank you for pointing out the back….So sorry I missed it…I was mentally going through my scrap pile…I thought I scrolled through more than once. Thanks for replying. You came up with a really neat idea. You always do. I love working with my scrap pieces. You did a really great job. I LOVE it. I love your work and always have from the moment I first laid eyes on it! I used to follow you but I got so overwhelmed with blogs in my email I just started unsubscribing to anything and everything. YOU ARE COMING BACK TO MY EMAIL! And again with the heart…omg I am in love!! !